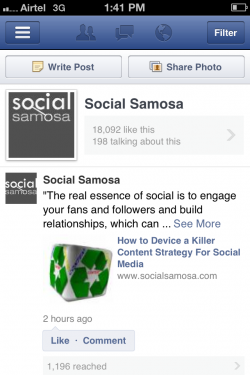 The much awaited Facebook Pages Manager App is finally here. Announced in the third week of May, it saw a soft launch and hence was released gradually. But after waiting for more than a month, Indian Facebook Page admins can finally lay their hands on this nifty app that can vastly improve their performance. Using this app, admins can post status updates, photos, respond to comments, get notifications and even check Insights (Total likes, People talking about, Weekly reach and Trends chart). The only exception being the inability to check Messages, you can expect this to be added in the next version though. However, in order to use this, you must also have the main Facebook app installed on your smartphone. 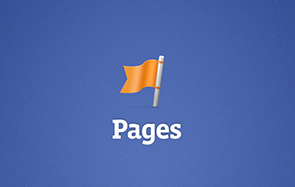 You cannot work with the Pages Manager app unless you are not logged into the main Facebook app. The app can also be used by admins who manage more than one page. Just tap the bars on the top left corner of the app and you will be presented with the list of pages you are an admin of. It has to be noted here though that this app is available only to iPhone and iPad users at present. Android users will have to wait for some more time. 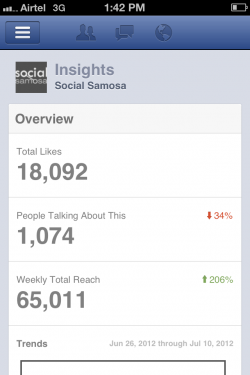 In other news, Facebook Insights has been updated with some really cool additions in the last few days. These additions will not only give you a clearer picture about your Reach, but they will now also reflect the impressions generated by mobile users. We all know that half of Facebook’s traffic comes from mobile and for some specific reason best known to it, the Reach data from mobile was not added into the Insights. Since only desktop reach was calculated previously, you were seeing Reach data far lesser than what it was actually. But Facebook has now started to calculate and add the mobile impressions, so now your Facebook Insights will show you the accurate data for your Reach. Apart from adding the mobile distributions to Insights, Facebook has also re-evaluated the counting of News Feed impressions. Previously, impressions were counted irrespective of whether the user scrolled and loaded the update on his News Feed or not. Not anymore. From now on, only those impressions will be counted when the user scrolls down and loads the update. Yes, this will definitely bring down your Reach count. But a low and accurate data is always better than an inflate inaccurate one, right?